A road trip to the American West is a little more epic than most road trips because travelers can take Route 66, AKA the Mother Road, the original road-trip road. There’s the lore of all the travelers who’ve come before you, the stunning landscapes, the shells of restaurants and gas stations from years gone by, and the weird roadside attractions. 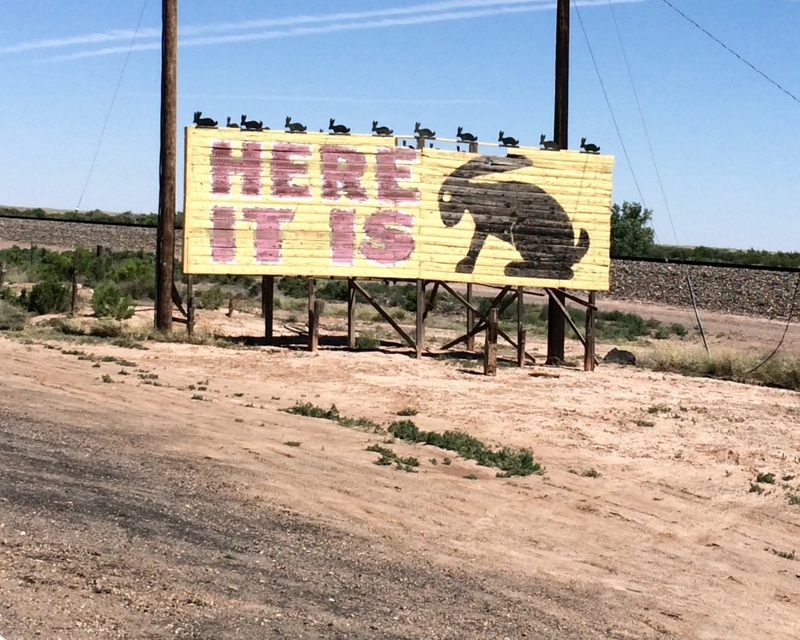 We were thrilled our Birdy Goes West road trip followed his historic path. 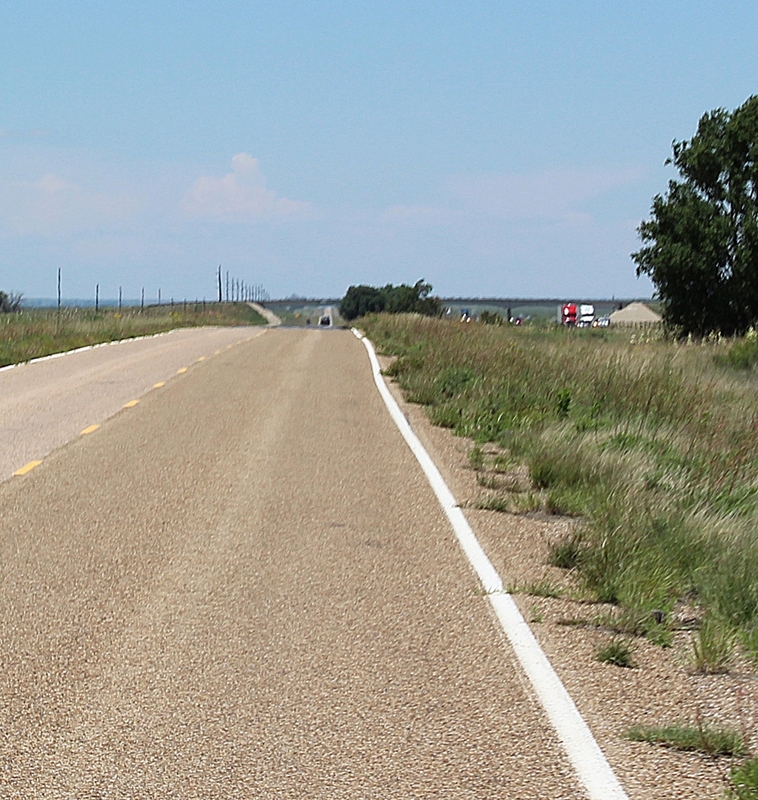 “It winds from Chicago to L.A.
Today, only pieces and parts of the original highway exist, and serious Route 66 road trippers will track those down and travel as much of the original roadway as possible. We were trying to make decent time, so we didn’t attempt to find much of the original highway (as cool as it sounds). Instead, we traveled along Interstate-40, which criss-crosses over much of the historic route, and we tried to work in many Route 66 landmarks as pit stops. 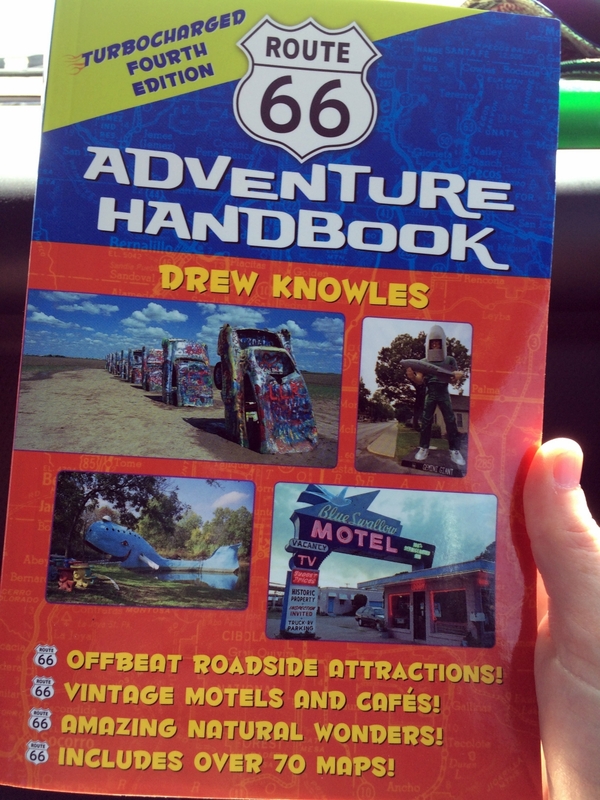 To help us with our journey, we purchased the Route 66 Adventure Handbook by Drew Knowles. As we drove along, I read aloud information about upcoming towns. We really appreciated having the history of the little places on our route, sometimes finding out how they were founded, how they were named, or what their unique claim to fame was. We discovered some great pit stops to explore along our way. As much as we would have enjoyed seeing the Blue Whale in Catoosa, OK, we were trying to drive completely through OK on our first day, so we didn’t stop. 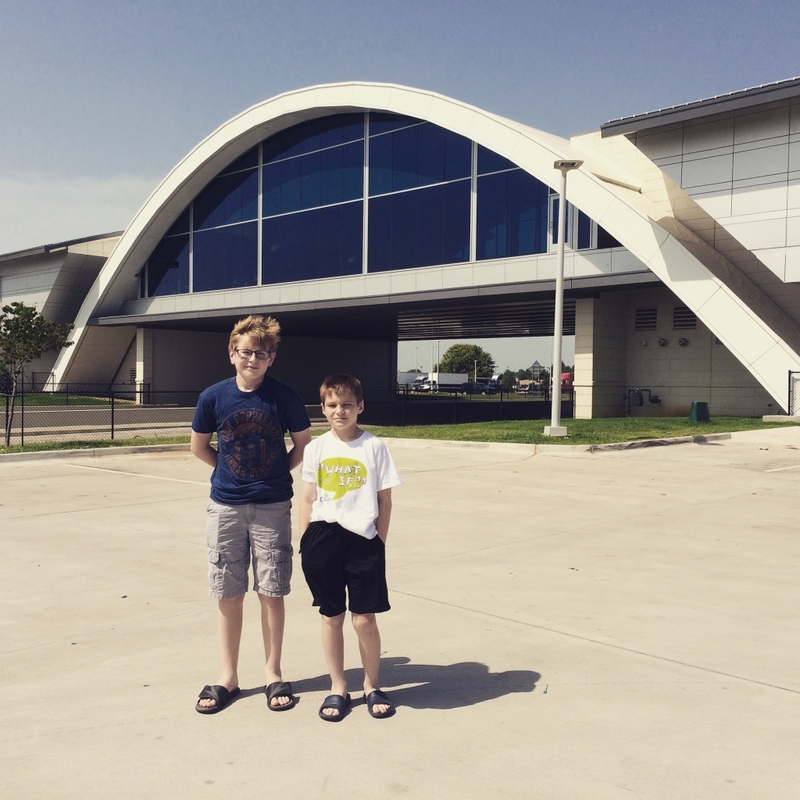 On our way home, we did enjoy a quick pit stop at what was once the world’s largest McDonalds, near Vinita. The arch used to be painted yellow to match the iconic golden arches. Inside, they have a display of menus from the Glass House diner that was the original restaurant to occupy the space when the overpass was constructed in 1957. We thought it was fun to sip our shakes as cars drove underneath. The Mohawk Lodge Indian Store and Trading Post in Clinton, OK, has a history dating back to the 1890s and made for an interesting stop. The door was locked but had a sign telling us to ring the bell several times. 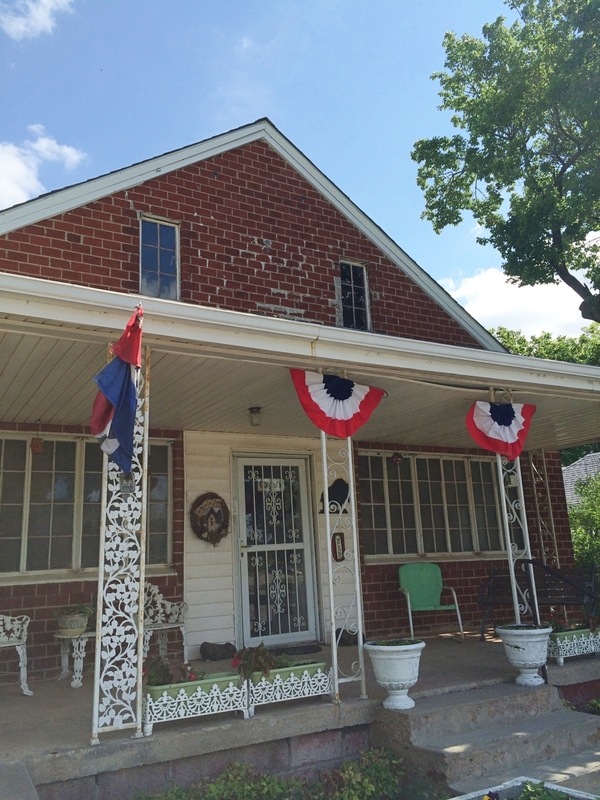 The elderly owners seem to live on the property and just open up the store as needed. The inside was stuffed full of artifacts, goods, and handcrafted wares. This place is not a tourist trap, like many of the “trading posts” you’ll pass along Route 66; instead, it actually still functions as a store for unique supplies used by Native American crafters in the area. The interstate took us right through Shamrock, TX, which I already wrote about; however, I couldn’t do a post on roadside attractions without mentioning this gem again. Shamrock has the U-Drop-Inn, a renovated building from the Route 66 era, which is now used for a visitor’s center. Fans of Disney’s Cars movies will recognize it as part of Radiator Springs. 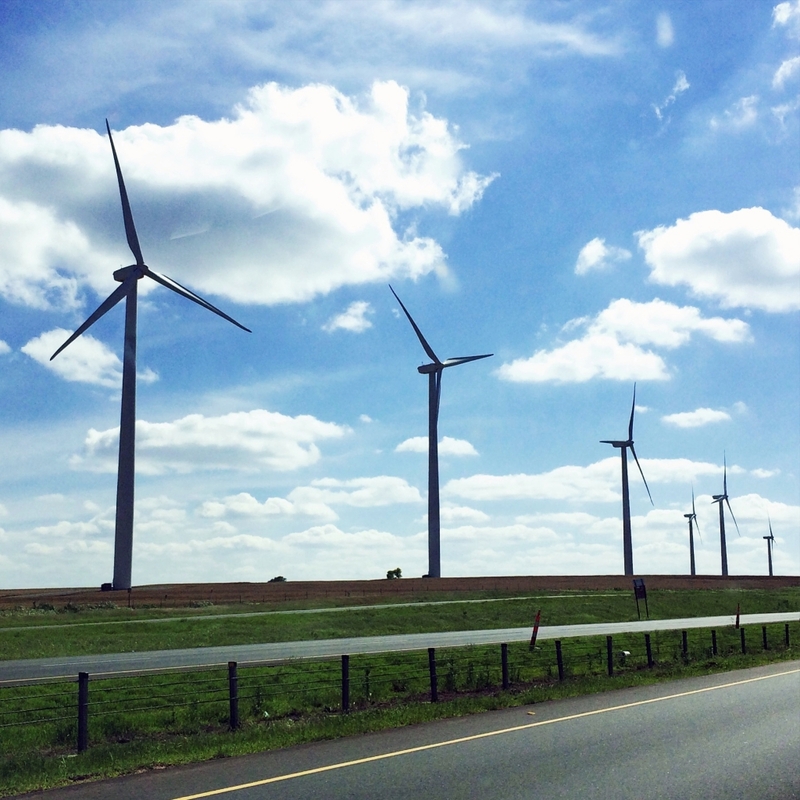 Along I-40, we were fascinated by the giant wind farms we passed. These behemoth structures are a sight to behold. One of our absolute favorite roadside attractions was the Cadillac Ranch, just west of Amarillo, TX. If you want to bring a smile to the faces of your children (or heck, even the grown ups), be sure to hop out of the car to explore this place. Better yet, bring along some spray paint and join the fun. 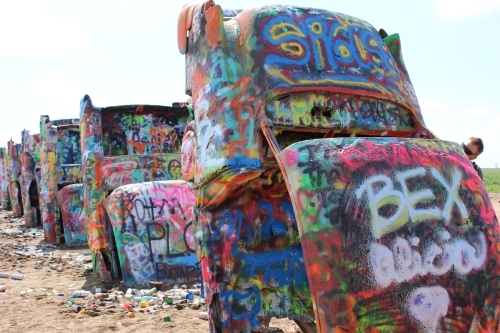 You can check out a whole blog post and a video about our adventures at Cadillac Ranch. 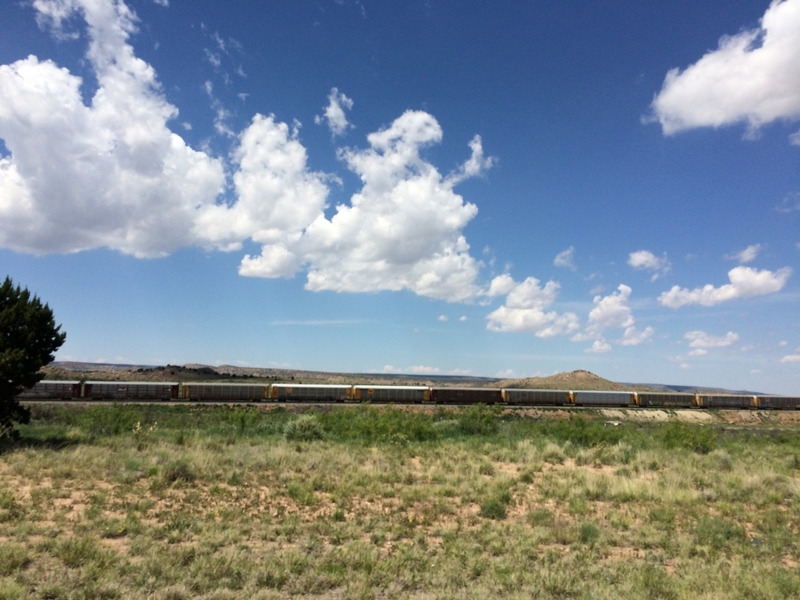 By the time we entered New Mexico, the landscape began to seem remarkably more western. 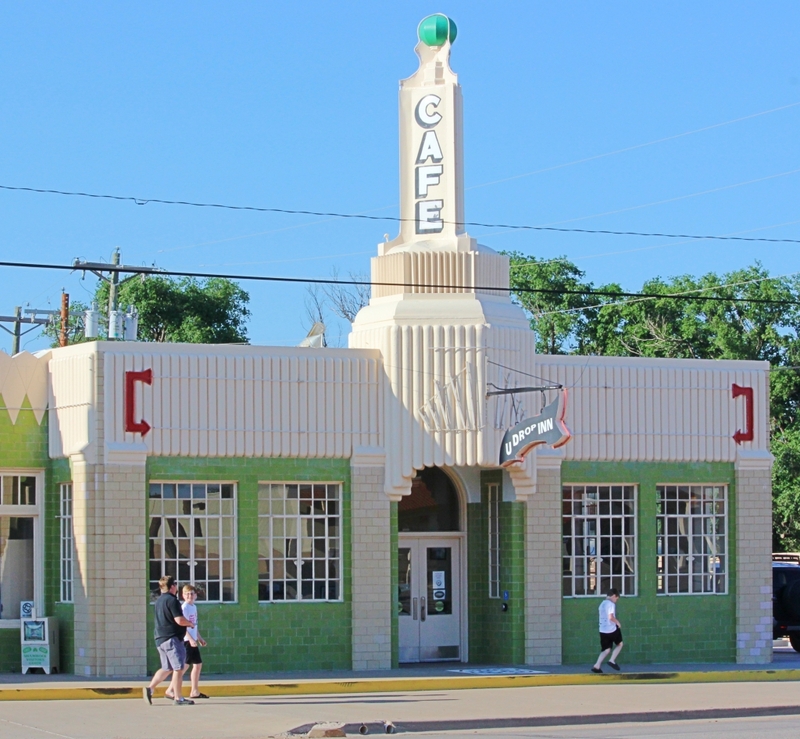 Just across the NM border, the town of Tucumcari is a must-stop for any Route 66 traveler. We enjoyed a tasty brunch at the cheery Kix on 66 diner and then took a walk up the road. 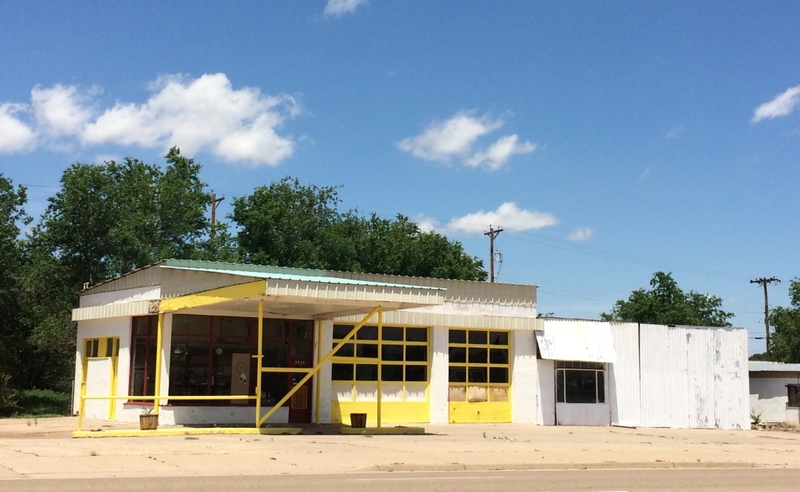 There are several architectural gems still standing in Tucumcari, some open for business, some not. 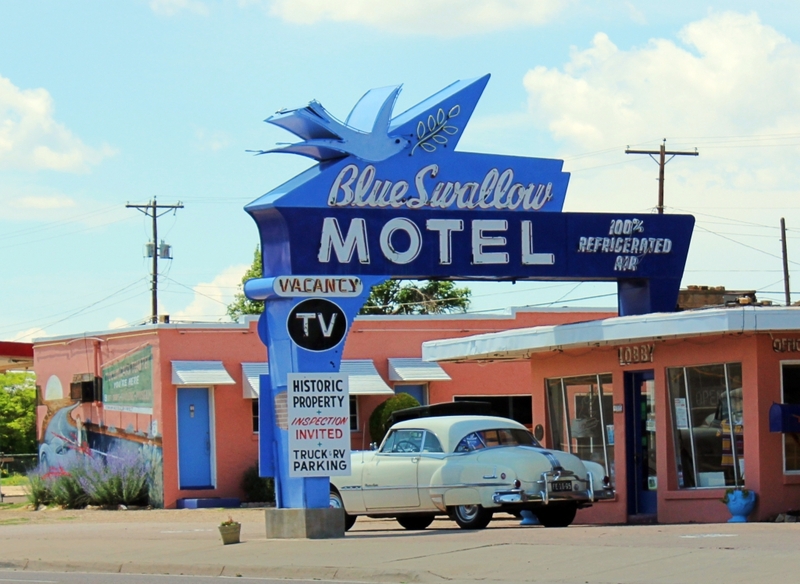 The Blue Swallow Motel is one of many places in town that would be fun to see at night with all of the neon lights glowing. During the day, this bright structure was still a sight to see. 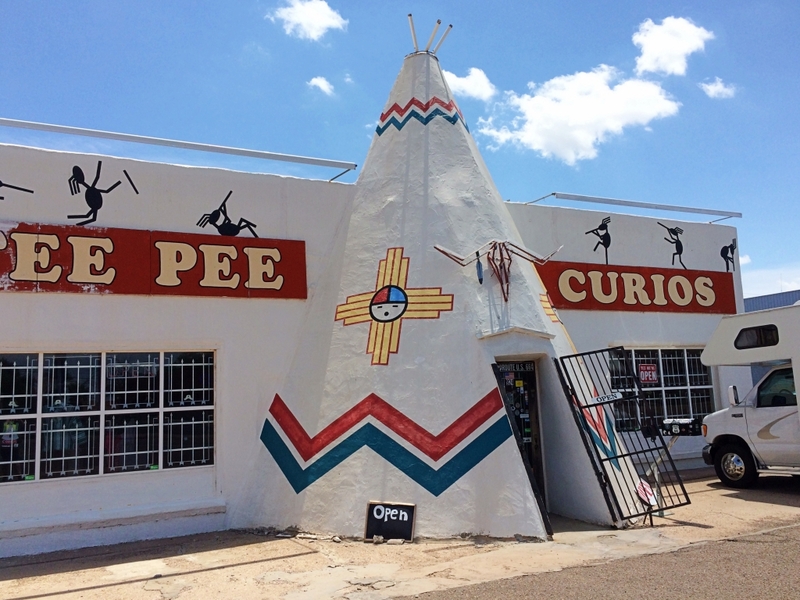 The TeePee Curios is definitely an iconic Route 66 structure. Though it was once a gas station, today it has a small gift shop. Somewhere in NM, we saw a sign for accessing the original Route 66 highway, so we decided to drive along the old road for a bit. 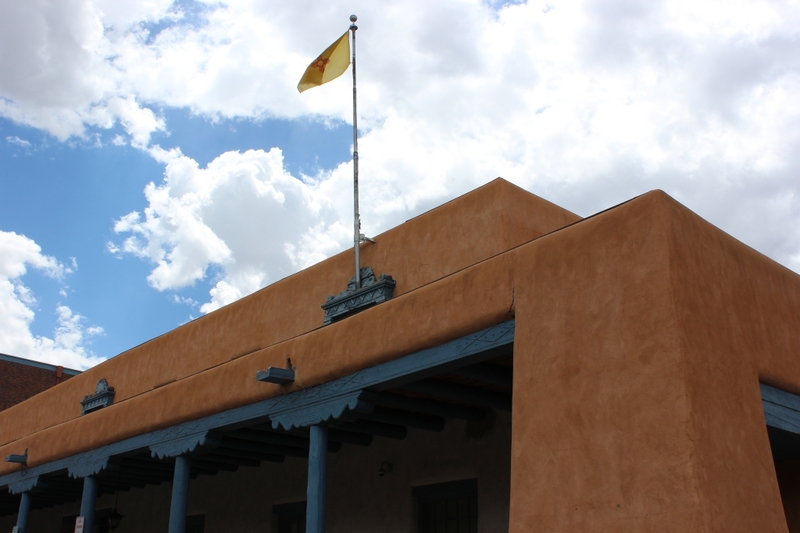 We made our way north into Santa Fe and enjoyed exploring the area for a couple of days. Santa Fe was once part of the Route 66 route, but the newer interstate goes south of this lovely town. It’s worth a trip off the interstate to see the adobe buildings on the town square. 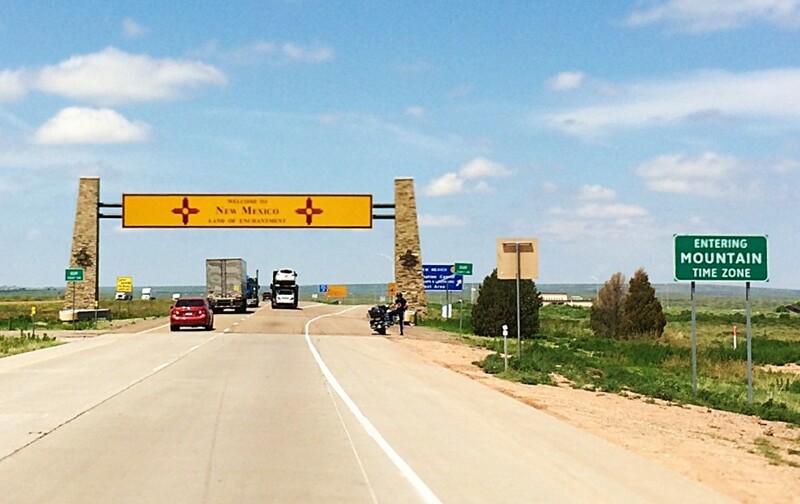 When we headed out of Santa Fe, we took the Turquoise Trail to Albuquerque to connect back to the interstate. 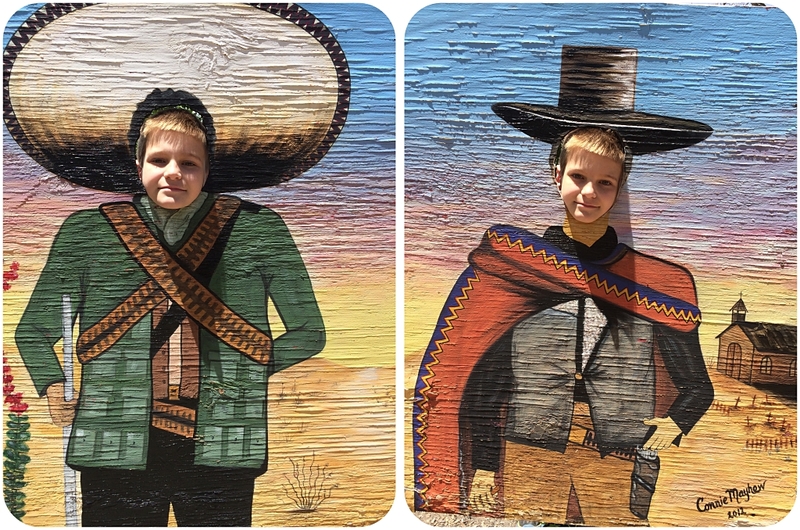 Along the way, we discovered a fun roadside photo stand. 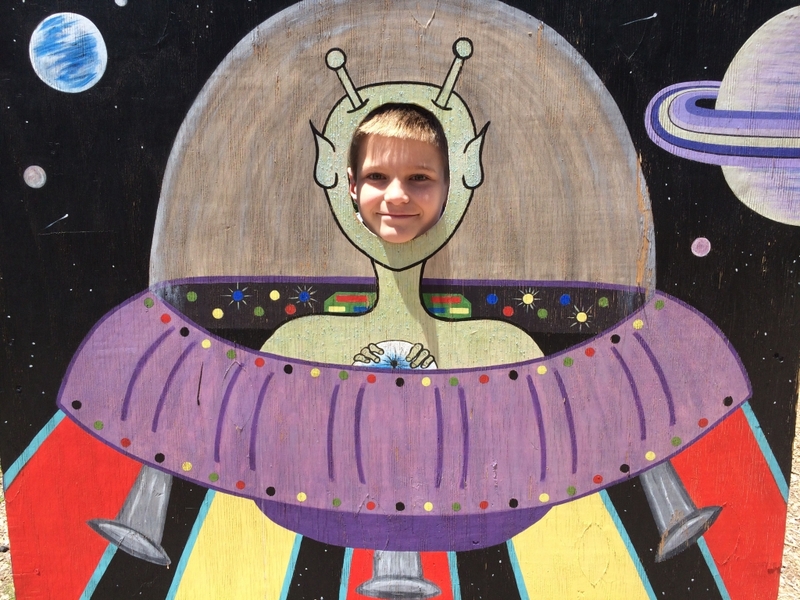 I had to pay my son 50-cents per photo for him to model for me. Totally worth it! New Mexico looked different from Texas, and by the time we entered Arizona, we could tell it looked remarkably different from New Mexico. The rocks became redder and larger (we even took a side trip to see the reddest rocks of all in Sedona). Normally, I read a lot on long road trips, but as we made our way west, I couldn’t take my eyes off of the landscapes passing by my window. Each view was a new painting, always something new to gaze upon. 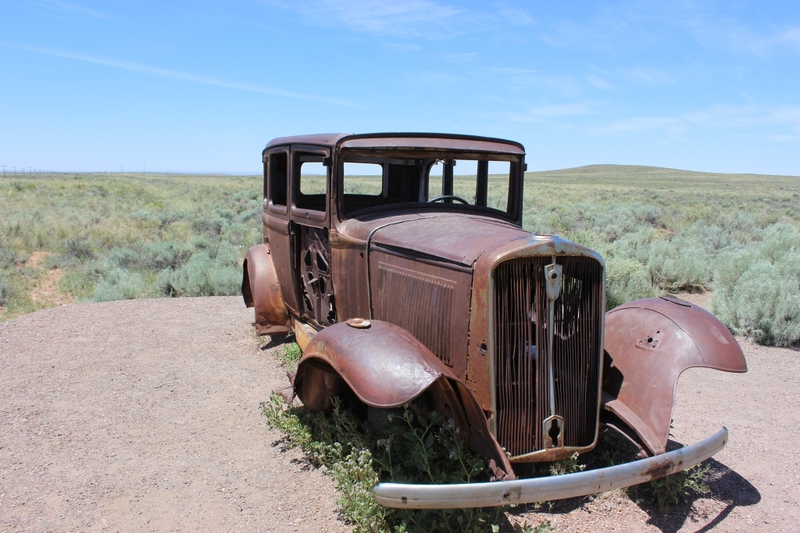 Route 66 once traveled directly through what is now the Petrified Forest and Painted Desert National Park area. Before our trip, we didn’t realize these two parks are basically one. There’s a nice driving route that takes you past wonders of each park, which I chronicled here. Today, visitors can still see where Route 66 crossed through the park, and the remnants of a vintage car serve as a monument to the Mother Road. It’s definitely worth taking the detour. 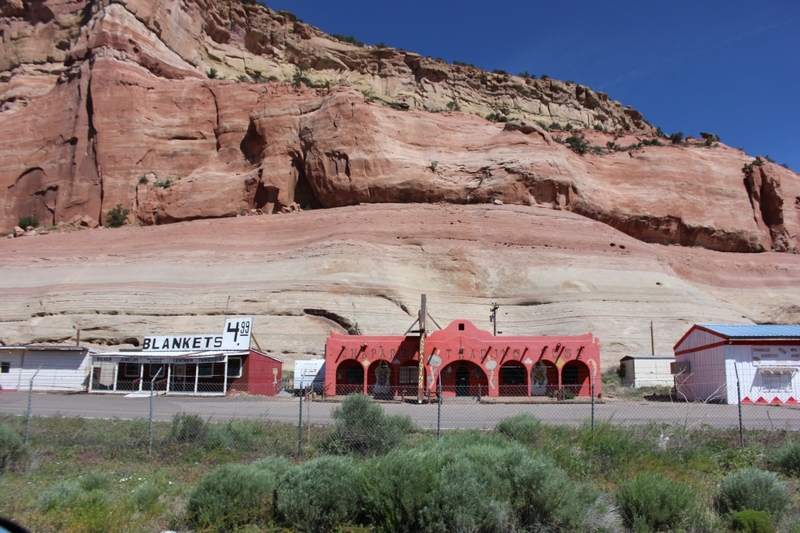 It’s also worth stopping at some of the interesting trading posts in the area. You can get a free piece of petrified wood and see amazing sites like this. 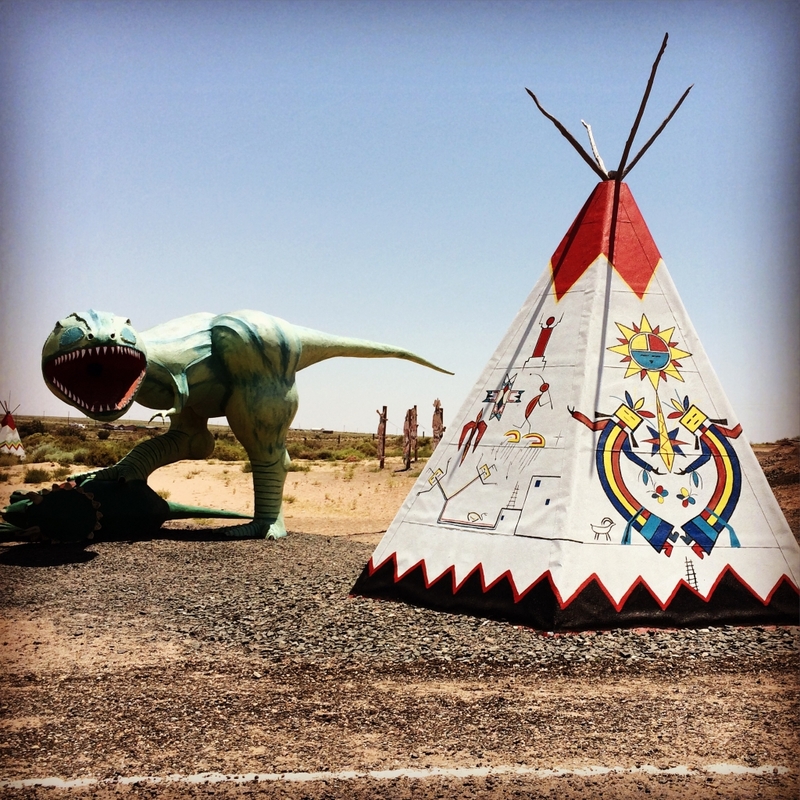 Though we saw some neat things in our national parks, nothing is quite as cool as a dinosaur invading a teepee village. 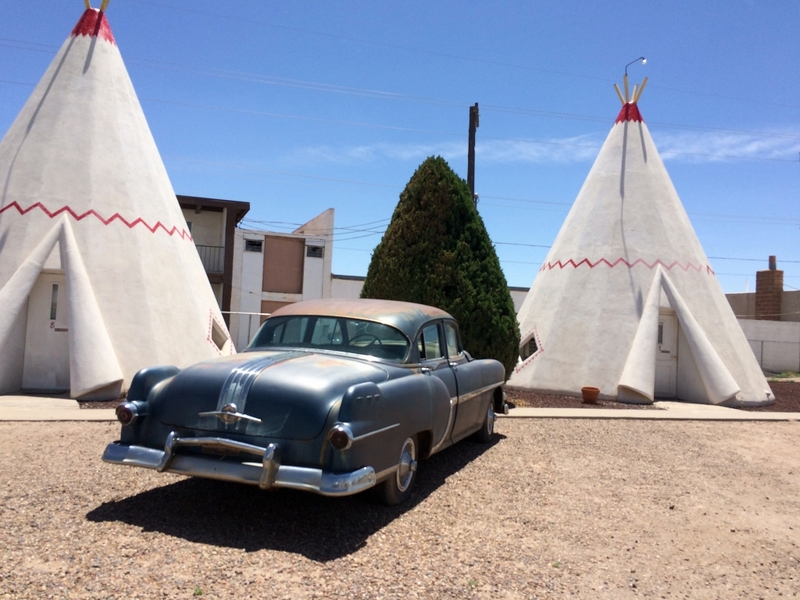 In Holbrook, Arizona, visitors can even sleep in a teepee of their very own at the famous Wigwam Village Motel. I love that they even park vintage cars out front. 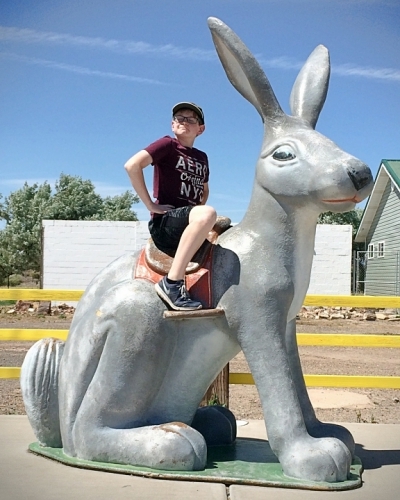 For miles, we had seen signs for the Jackrabbit Trading Post, near Joseph City, AZ, and had heard about the giant jackrabbit that sits out front. Our curiosity was growing as we drew closer. 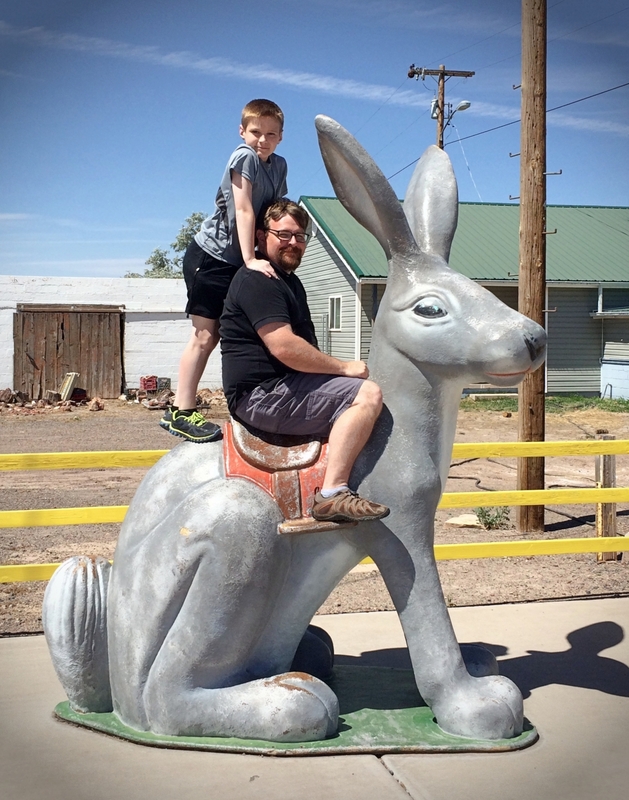 I have to say, the photo opportunity with the giant jackrabbit was really worth the pit stop. I can’t imagine they’d have much traffic without their history and marketing, but we were so charmed by the place we even bought a t-shirt and a sticker. Job well done, Jackrabbit Trading Post! Everyone has heard the Eagles sing: “Well, I’m standing on a corner in Winslow, Arizona, and such a fine sight to see…It’s a girl, my Lord, in a flatbed Ford slowin’ down to take a look at me.” The small town of Winslow has managed to turn this into a little roadside attraction, making it possible for you, too, to be standing on the corner in Winslow, Arizona (or in our case, sitting on the corner). They even have the flatbed Ford parked on the corner. 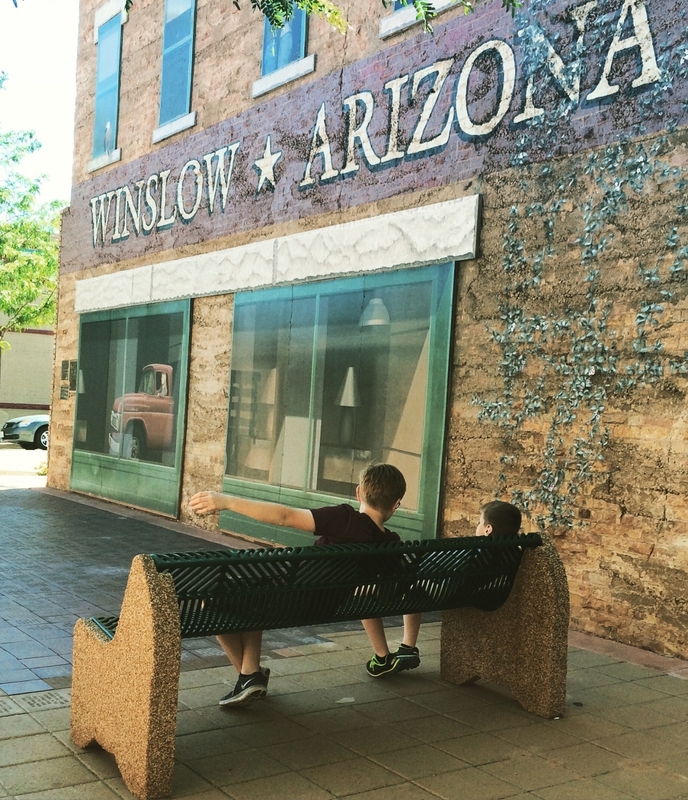 Judging by the number of tourist shops and restaurants in the area, Winslow is doing quite well for itself by marketing its connection to the Eagles song. 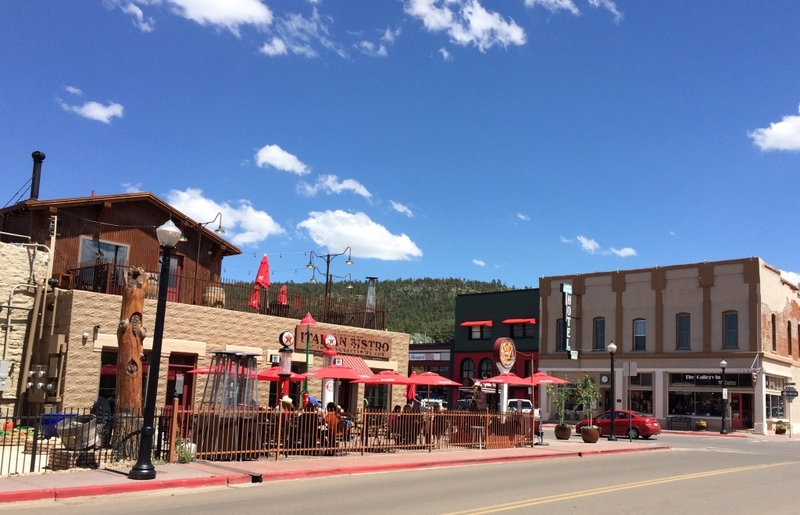 After passing through the lovely Flagstaff (and detouring for a short stay in Sedona), we continued our Route 66 journey. 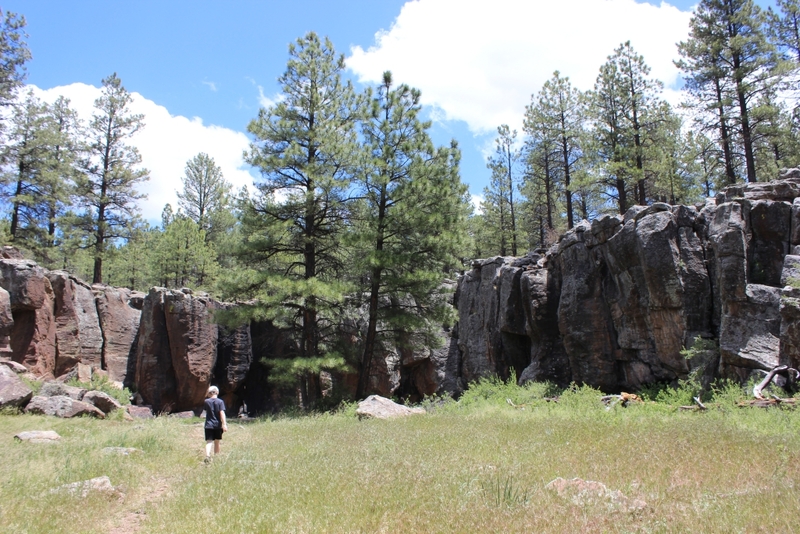 It happened to be National Trails Day, so we decided to find a roadside trail to take a hike. The Keyhole Sink Trail ended up being a perfect place to explore on this beautiful day. We pass through another charming town, Williams, AZ. Many travelers may be familiar with Williams as the turn-off for the Grand Canyon National Park, which we saved for our trip home. Williams is a great place to stop for lunch or dinner, with several local restaurants and a lovely downtown to explore. It still has the feel of an western railroad town. Visitors can catch a train here and ride it to the Grand Canyon. As with many spots on our trip, we wished we had more time to explore. 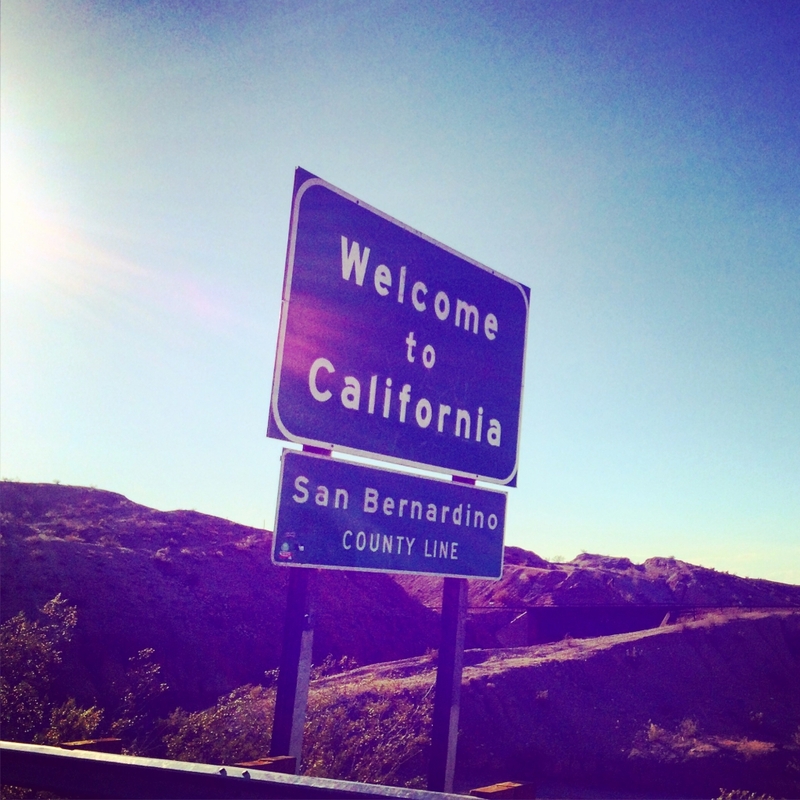 Passing the welcome sign into California felt truly epic after driving 1400 miles across the country. Another state, another change in scenery! 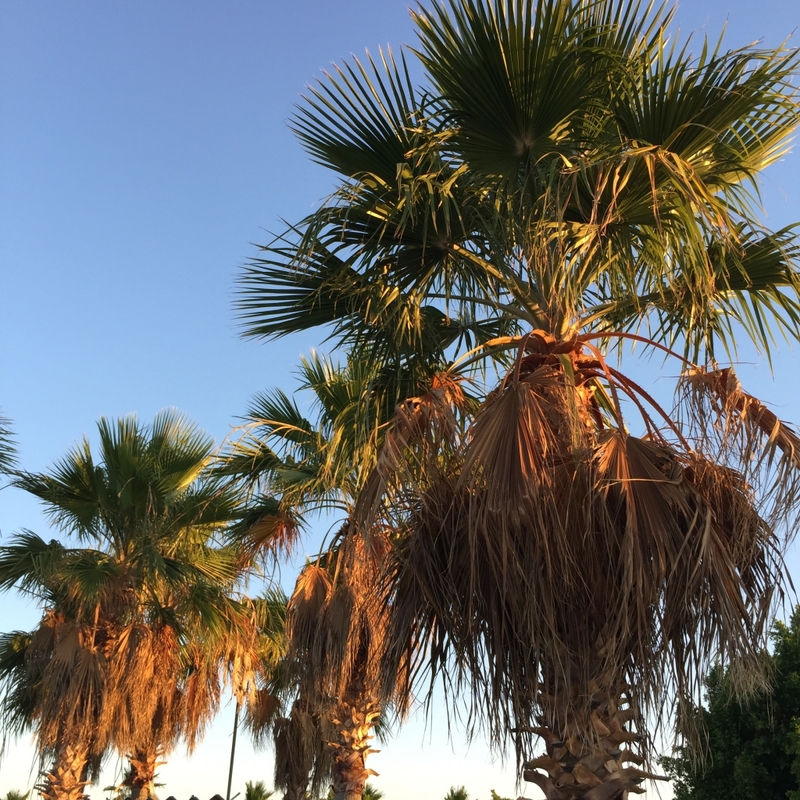 As we pulled over for the night in Needles, CA, we were greeted by palm trees glowing in the last rays of the evening sun. 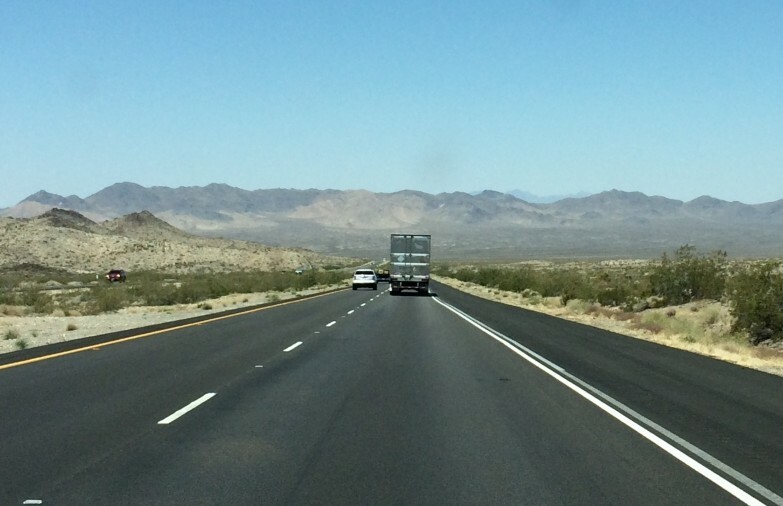 Our route took us along the southern edge of the Mojave Desert National Park. The ever-changing southwestern landscapes we had enjoyed in New Mexico and Arizona gave way to a long, flat muted desert scene. The mountains in the distance seemed to stay distant as we rolled and rolled along though this hot, desolate landscape. 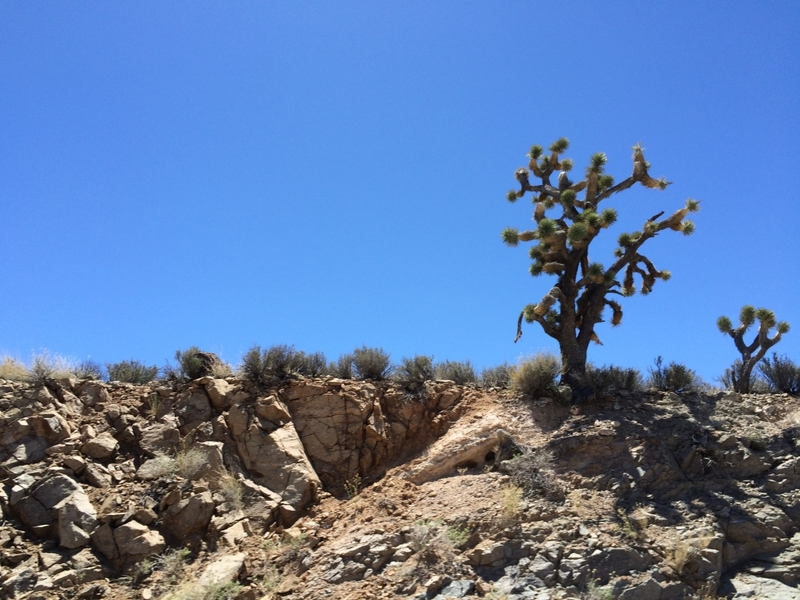 Though we didn’t go into Joshua Tree National Park, we began to see Joshua Trees along the side of the road, something we Missourians had never seen before. The odd-shaped trees were the only roadside attraction for much of our drive through this part of California. Shortly after the Mojave, our route parted ways with the track of Route 66 as we veered north to head up to Sequoia National Park. We had throughly enjoyed seeing the landscape change as we headed west, and we really got a feel for the geography of our great nation. I hope our children can appreciate this as they study the Native Americans, the westward pioneers, the Gold Rush, and the travelers of the Great Depression. 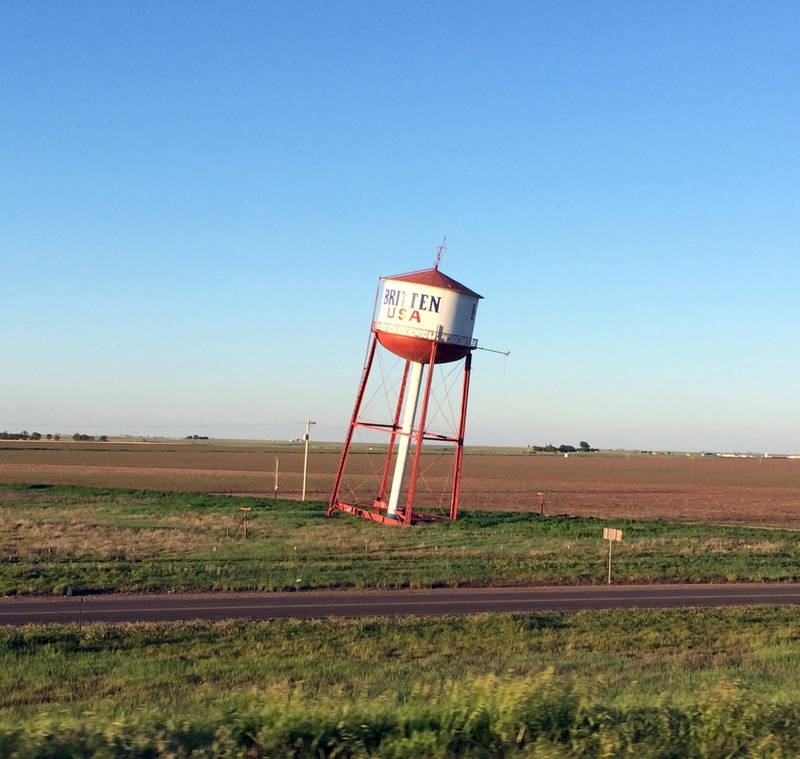 While we didn’t come close to seeing all of the cool roadside attractions along the way, we saw a lot of fun places and interesting landscapes. We truly did get our kicks on Route 66! Posted in: Places We've Explored. 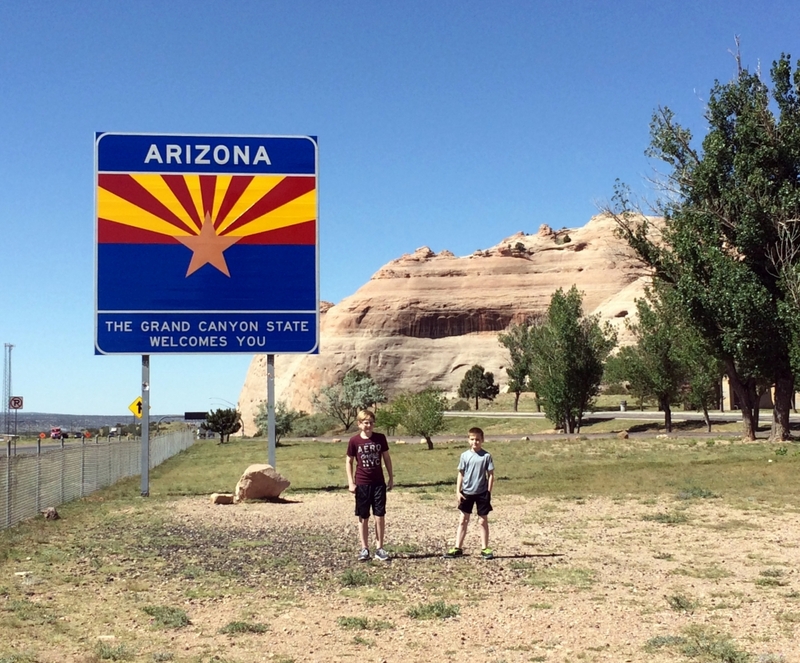 Tags: Arizona, Birdy Goes West, California, New Mexico, Roadside attractions, Texas. “nothing is quite as cool as a dinosaur invading a teepee village.” Truer words were never spoken ;). great info!! great pics!! 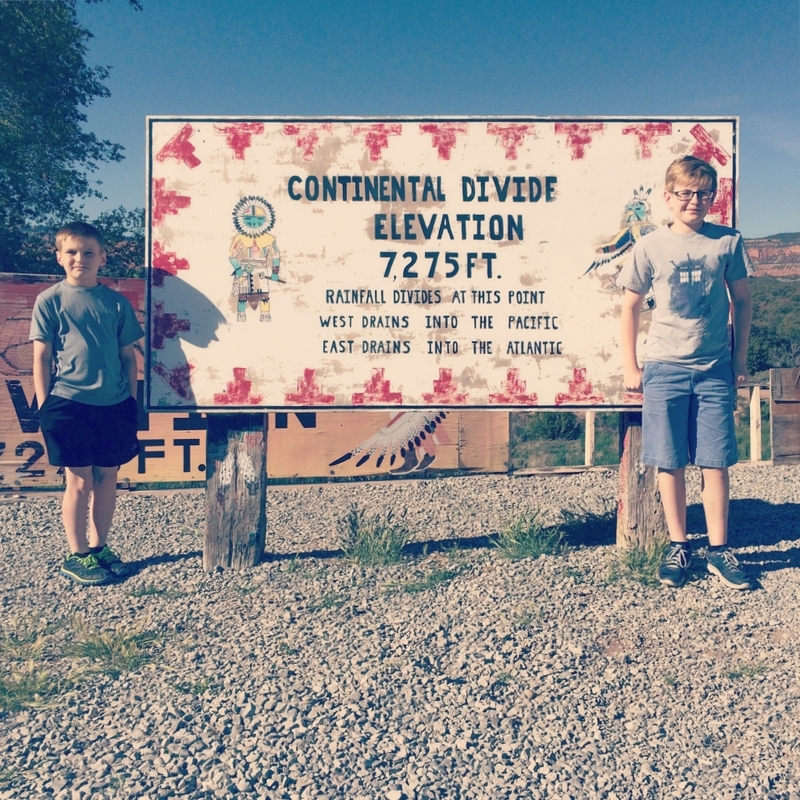 we are planning this trip in October… looks like you traveled I-40 most of the time which is what we would want to do with our 5th wheel but we still want to see the roadside attractions. are there any roads we should absolutely stay away from? Any advice is welcomed! Thanks for stopping by, Rick! We did take I-40 all the way from Missouri to California, only turning off to go up to Santa Fe and south to Sedona. All of the attractions in the post were right off of the interstate. If you include Sedona on your trip, do not take highway 89A south, as it is curvy switchbacks. 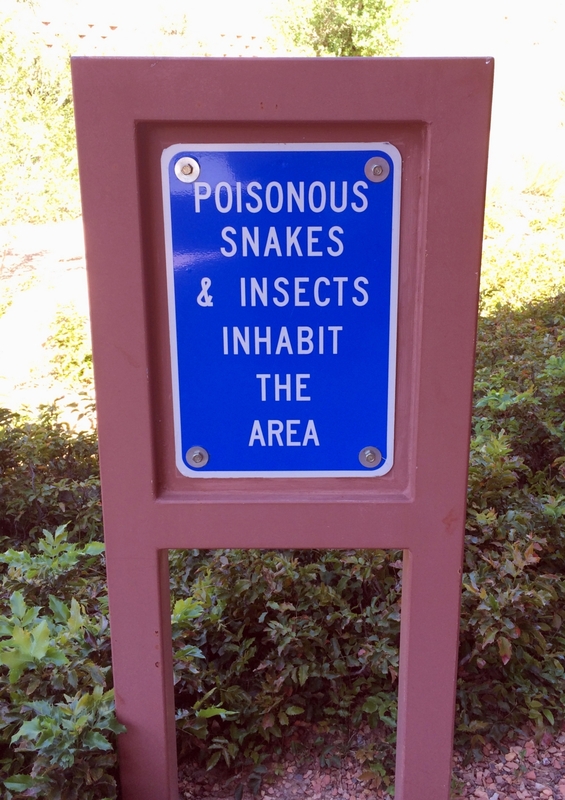 Instead, the RV park told us to take I-17 south. Otherwise, we didn’t encounter any bad roads until we headed into Sequoia and when we headed west out of Yosemite. Have a great trip!